The mommy makeover is not just for mommies. The mommy makeover is my personal favorite procedure to perform in plastic surgery. So what is it exactly? tighter abdominal muscles + liposculpted tummy + fuller, more youthful-looking breasts = mommy makeover. Who else is getting the mommy makeover? Women who have had multiple abdominal surgeries which can cause sagging skin and an uneven lumpy appearance. The truth is, mommy makeover candidates include anyone who wants the physical transformation provided by combining a tummy tuck, liposuction, and cosmetic breast surgery. Breast surgery can be an augmentation (smaller or bigger) with or without a breast lift. Who is the ideal candidate for a mommy makeover? In the majority of cases the procedure of a tummy tuck with a cosmetic breast procedure, is a safe combination for most women. However, there are certain requirements most Board Certified Plastic Surgeons believe are necessary to consider someone an ideal candidate for this operation. In good overall health without any serious medical conditions. At or near their ideal body weight or the weight they want to maintain. In a good, positive mindset with a realistic expectation for the surgery. A non-smoker or has quit smoking at least a month before the procedure. One of the most common questions I hear from women considering a mommy makeover procedure is, “Am I to old”? Age is really a less important factor than the person’s overall health. For example: a 60-year-old woman who leads an active lifestyle that includes regular exercise and good dietary habits with no other medical problems may be a better candidate than a younger woman who is less healthy and a smoker and one that is over weight.. The best way to answer that question is to breakdown the multiple procedures individually. Tummy Tuck (Abdominoplasty): Women from India, California, Florida and even Alaska travel to Premier Plastic Surgery of New England to have me perform my Total Tummy Tuck Care. Total Tummy Tuck Care is the integration of western surgery techniques combined with eastern holistic philosophies to create optimal pre/post-operative care. Liposuction: Sculpting the final results of a tummy tuck usually involves targeted fat removal using liposuction. Breast lift (with or without implants): The loss of breast volume and shape is one of the most common concerns of women after having children. But those same issues occur after weight loss as well. And women know all too well that breasts gradually begin sagging as they get older. Breast augmentation can restore volume, but in many cases, a lift is also needed to create a more youthful shape. These procedures can all be performed as individual operations, but combining them is often an attractive option. It is more cost-effective and patients only have to plan for a single recovery. At Premier Plastic Surgery of New England, I understand that my patients are committing to an emotional, physical, financial, mental and spiritual journey when choosing elective plastic surgery. I am only honored to have embarked on this journey with all my patients. I hope that if you are the right candidate for the mommy makeover, that I may have the opportunity to join with you on your path to the new you. Although the results of a tummy tuck are technically permanent, the positive outcome can be greatly diminished by significant fluctuations in your weight. For this reason, individuals who are planning substantial weight loss or women who may be considering future pregnancies would be advised to postpone a tummy tuck. Here at Premier Plastic Surgery of New England, we are pleased to offer our patients a recovery coach to help you achieve the best recovery and long-term results as possible. Do you wish you had a zipper on the back of your neck to tighten it? Have you ever been caught pinching the skin at the sides of your neck or at the back of the neck and say, “if I could just pinch like this my neck and jowls would disappear and I would look younger”. If only it was that simple. The skin on the neck gradually looses its elasticity and collagen as we age and we end up with hanging and sagging skin that is unattractive. What can we do to tighten it? Facial exercises? Not really. Facials, creams, peels, botox and fillers? Well, they can help but likely won’t achieve the results you are looking to gain. This is why the beauty industry is a 6 billion dollar market. So what should you use? There is no one answer that will fit everyone’s needs. To understand the treatment options I need to first dissect how I approach the neck. There are some patients who are not candidates for minimally invasive procedures and require a neck lift. 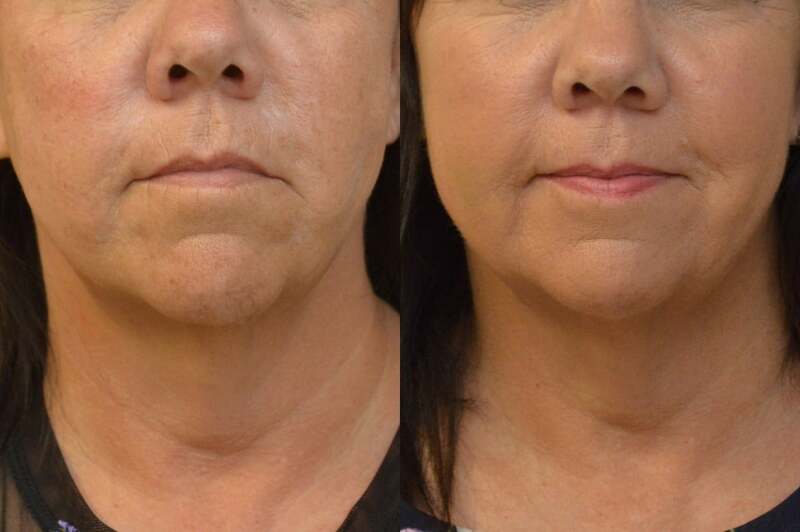 For these patients the surgeries performed in the hospital under general anesthesia and the skin is elevated off of the underlying platysma muscle of the neck and then the neck muscle is tightened underneath first thereby strengthening the structural integrity of the muscle and then the skin is redraped on top of the muscle and pulled. This type of surgical neck left can last for over 10 years. So what options are available for those of us that do not need a neck lift but are starting to see gravity take effect and need a “tweek”? The answer are Eurothreads. Thread Lifts have been around for many years but the older techniques used permanent threads that were met with increased complications. The new threads are now dissolvable. How do they work? They are made of a dissolvable filaments and are placed with needles under the skin. They trigger your body to cause an inflammatory reaction and collagen gets deposited for the first 6 months, then the threads start to dissolve away and the collagen remains for an additional 6 -12 months. The procedure is an hour in the office using novocaine laughing gas (Pronox). Most patients experience soreness for a few days that can be managed with Tylenol. Please come and see me at Premier Plastic Surgery of New England if you are interested in learning if threads are right for you.